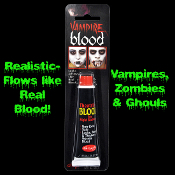 Looks and flows like real Blood! Includes instructions and bloody suggestions on the package. *Can permanently stain some fabrics and surfaces.